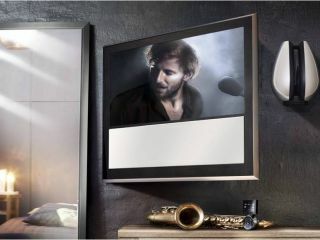 High-end television maker Bang & Olufsen has unveiled a 32 inch version of its BeoVision 10 family. The Beovision 10-32 is the third model in the family this year – which B&O is celebrating as a production record. "The BeoVision 10 family is characterized by the idea of 'adding life to your wallpaper', and with the new 32" version, this integrated television solution also appeals to an audience that loves great design, but wants a screen size that does not dominate the room," says the German manufacturer's release. "BeoVision 10-32 is based on the same chassis as the 40" and the 46" versions, and design-wise it adopts the same principles as its two larger siblings, only on a smaller scale, it continues. "This includes a removable front fabric loudspeaker grille in a range of colours, and the unique, high-gloss polished aluminium frame that makes the television appear even thinner than it is. "The rear part is available in either black or white." Although B&O do not set prices – the 32 inch television will go on sale in its Knightsbridge store for £4,400, but before you gasp, that does include a Beo4 remote. And, of course, you'll be the owner of a B&O television.